This document is still under development! This is the main clock signal. The IO clock is the same as the core clock. The global reset signal (high). This is a synchronous signal and is implemented as a "soft" reset. Data write from core to IO device. This is a 32-bit signal, in big-endian order. Data read from IO device to core. This is a 32-bit signal, in big-endian order. IO address from core to IO device. This is a 9-bit signal, word-aligned (10 downto 2). Write-Enable signal from core to IO device. 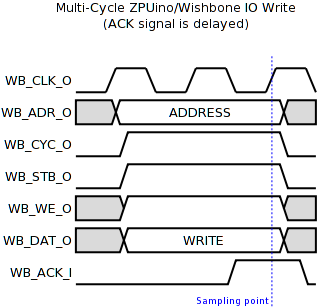 ACK signal from IO device to core. INTERRUPT signal from IO device to core. This signal should stay asserted until a IO operation to device clears it explicitly. 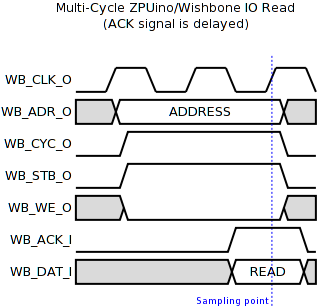 This signal might have other name, like WB_INTA_I or WB_INTB_I. This allows mapping more than one interrupt line. SPP (Special Purpose Pin) enable signal. If device uses PPS, it should assert this to use GPIO pins. SPP write signals. These will be mapped to GPIO pins using the PPS multiplexer. These signals are optional. SPP read signals. These will be mapped to GPIO pins using the PPS demultiplexer. These signals are optional. The counter shall be 64-bit, and we must be able to read the low-part (lower 32bit) and the high-part (upper 32-bit) as if they were two 32-bit registers. It should have an enable register. When enable is one, the counter shall count upwards, incrementing one at each clock cycle. When zero, it shall keep its previous value. We should be able to write the counter value itself. 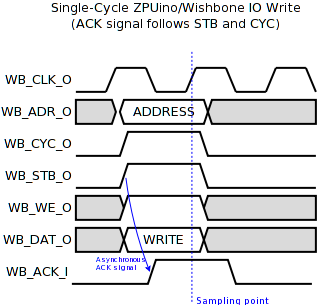 In address 0 we map a single-bit register (counter_enabled_q). All other bits read as '0', and are ignored during writes. Address 1 is not used. 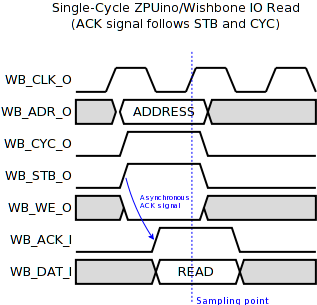 Address 2 maps the lower 32-bit part of the 64-bit register. It can be read and written. 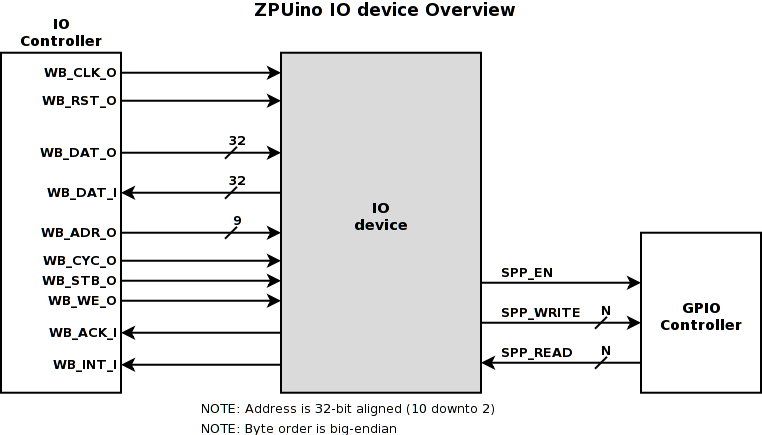 Address 3 maps the upper 32-bit part of the 64-bit register. It can be read and written. And that's it! The new device is now attached and ready for synthesis.